There were no Heavy-humour comics or cartoons to trumpet its arrival, but yesterday’s Team Fortress 2 update was its most important in quite some time. 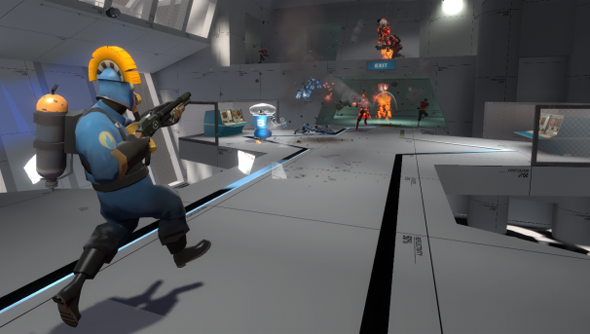 Though the TF2 community long ago became accustomed to helping in the development of their favourite game, this patch was the first in which Valve were comfortable releasing unfinished maps and modes. Two new ‘beta maps’ arrived yesterday without the balance or aesthetic finish you’d expect from a Valve production, but bearing a gift: a new game mode named Robot Destruction. On the mode’s map, Asteroid, each team is asked to hunt down and kill the podgy, harmless bots that trundle about the enemy team’s base. Each bot killed drops points, to be picked up and added to your team’s total. Points are stored in a battery, which can be captured by opponents. The other map is named Cactus Canyon, and is designed for Payload. Valve say both maps are very much subject to change, from the placement of their health kits to the layout of their corridors. In short: don’t get too attached. But you can play Asteroid and Cactus Canyon now by loading up TF2, clicking ‘Multiplayer’, ticking the beta maps box and picking a mode. Do you think you will? The developers will run a set of official servers, and are allowing players to host their own.